Rise Up Singing is a popular folk music fake book containing chords, lyrics, and sources. There are 1200 songs in the 2004 edition. The book does not include notation of the songs' melodies (with the exception of the two sections on rounds), meaning that users must either know the tune, or find a recording, to be able to learn many of the songs. 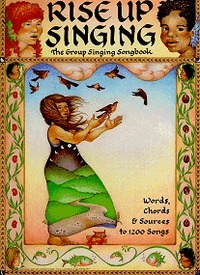 It was first published in 1988 by Sing Out!. It is edited by Peter Blood and Annie Patterson. Songs are arranged by category: there are 35 different categories arranged in alphabetical order, plus artist, subject, title, culture, holiday and musicals indices. Since the book includes only lyrics and chords without notation, it is relatively compact in size and also relatively inexpensive. Recordings of the songs, which can be used as learning tools, have been made for each song in the book, and are now available on CD. Only enough of each song is included to learn the tune; not all verses are sung. The book grew out of the 1973 homemade songbook by Peter Blood, Winds of the People. In the United States, there are monthly sings (singalongs) where groups gather to sing selections from Rise Up Singing. ^ a b Ratliff, Ben (2008-02-10). "Shared Song, Communal Memory". The New York Times. Retrieved 2008-02-10. This page was last edited on 3 February 2019, at 03:38 (UTC).